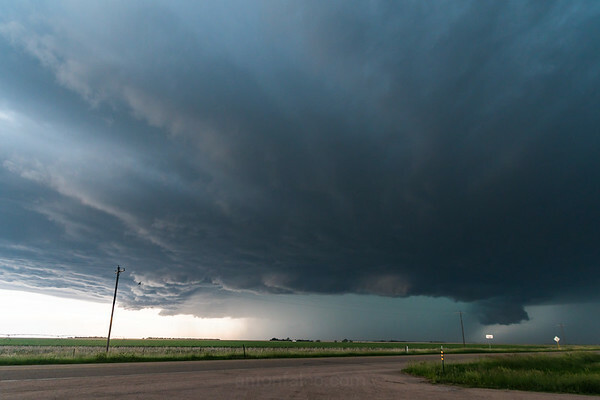 Much like your standard chase days, our chase crew woke up around 8am in Burlington, Colorado after chasing a storm throughout central Colorado the previous day (May 25th). 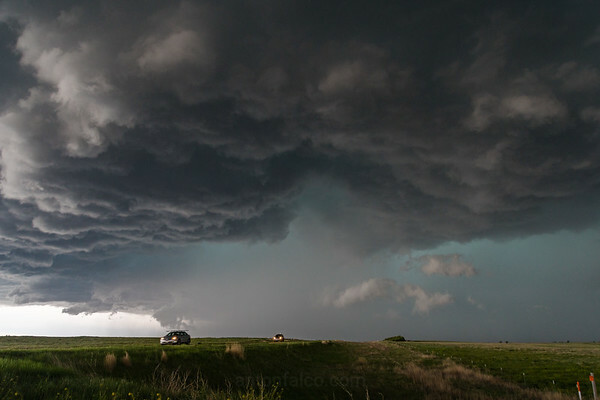 The storms that erupted (more struggled to life) on this day were not impressive, which was to be expected. The real day of interest was, of course, the day you're reading about now (and Saturday, May 27th, but I'll cover this day in a separate blog post). The SPC (Storm Prediction Center) had put out a "Slight" rating for severe thunderstorm development and a 2% chance of tornado development in the eastern Colorado area. Easterly surface winds would also mean Orographic lift (higher elevations and easterly winds would mean moist air would be forced to rise and not need a forcing mechanism, such as a dry line, for storm initiation) would come into play. Our lead meteorologist, Gregg, who lived in Colorado for years, knew this would be a factor on the day. I had never been in Colorado until the previous day, so this was a new experience to me. We knew when we decided to rest in Burlington, CO, which is located in far east central Colorado, that we were significantly too far east for any potential tornadic development, as any storms that would produce a tornado, even briefly, would do so early on in its life cycle while discrete before "lining out" (congealing into a messy mass of thunderstorms, and a reduced chance of tornadic development). We would have to be there for storm initiation of discrete cell(s) (or the merging of updrafts and waiting on the dominant cell to prevail) for the chance to see anything that forms, if at all. That suspicion was confirmed after looking at the short range, convection allowing, weather models (HRRR, RAP), as nearly all models and several runs showed convection occurring as far west as Denver and as far east as Limon. More of the hail sheets coming quickly towards us. May 26th, 2017. As a result of this information, we drove back west and set up in the Limon, Colorado area by around 2:30pm MT and waited initiation. The first storms were starting to build around Deer Trail, Colorado around this time, so we pushed north towards that area to intercept. The above picture was taken around 4:30pm as the first few cells began to come to life in the area. We got ahead of the storms by taking some side roads (mostly gravel) before the storms went through, so they were relatively dry and had traction and waited for further intensification. I wish I knew exactly where we were at this point to tell you, but being the driver/photographer and following the lead car, so I was not actively viewing the GPS at this point. My best guess would be in an area just northwest of Last Chance, Colorado. The storms were not very intense, but were steadily growing. We let them pass over us so we could get behind and to the south side to view any potential tornado formation. As the storms were starting to take shape, we decided to head back toward Last Chance. Google Maps told us the side roads were either gravel or paved. They weren't. Getting back to Road 71 was a significant challenge. The roads were mostly mud (as a result of the storm passing over and soaking them) and as slick as ice. 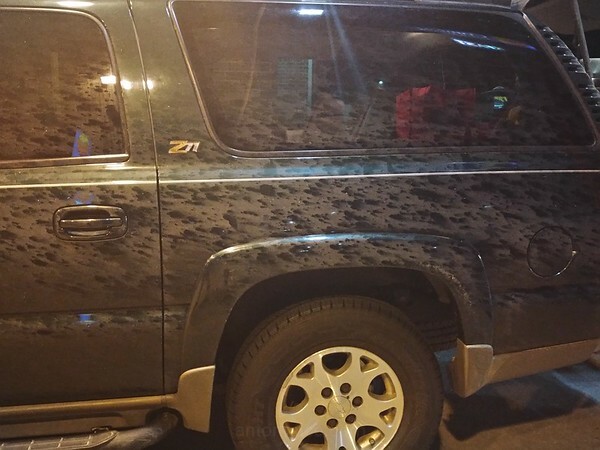 This time lapse video shows how slick and volatile the driving conditions ended up. We finally got clear of the mud roads, got back to pavement, and proceeded to head south on Road 71 and proceeded east to Anton, Colorado. Storm movement was manageable at the time (around 27kts), so we could make up ground. 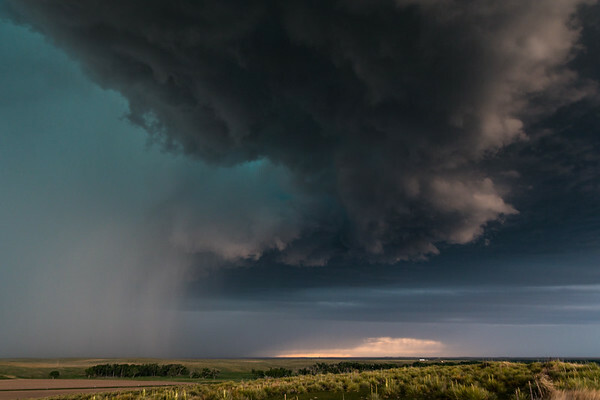 By the time we reached the city, we had caught up and got some excellent images of the very photogenic storm. It was rotating the entire time and, despite only seeing what looked like gustadoes, were reported as tornadoes on the SPC Storm Reports Page. We kept pace with it going east up to Kanorado, Kansas until dark. It put on a very entertaining lightning show the entire drive. Click here for the time lapse video of the entire day/event. From about the 7 minute mark on is where the storm really ramps up, and you can see some amazing structure. 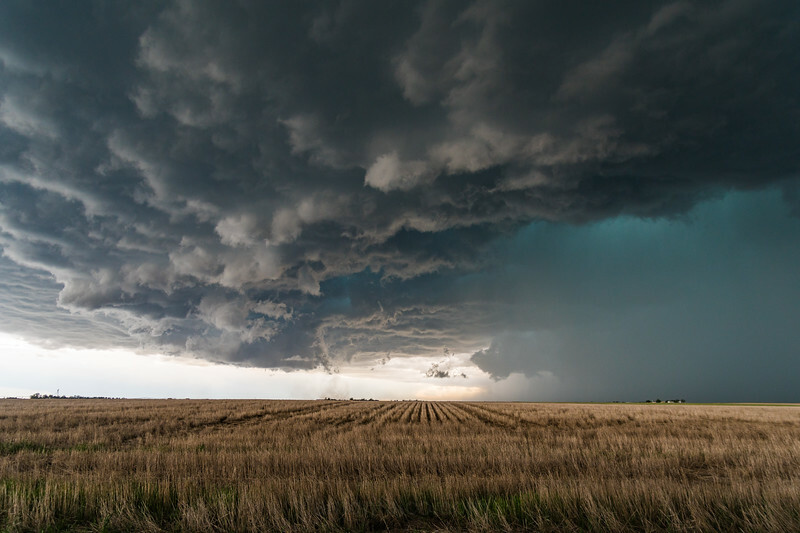 We drove through the remnants of the storms that merged shortly after leaving the Kanorado, Kansas area and the lightning/golf ball sized hail that the storms dropped was both thrilling and frightening. 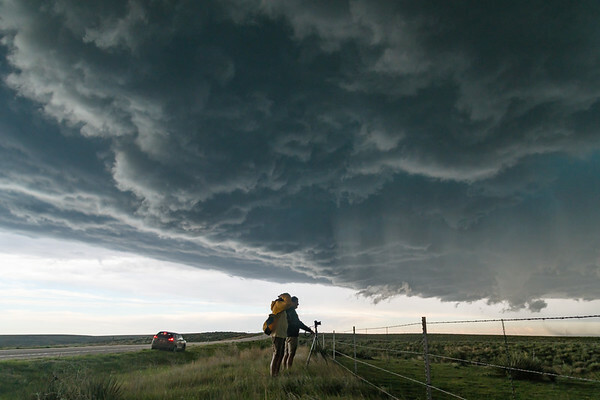 A very familiar blend of emotions in storm chasing. Destination for the night: Hays, Kansas.